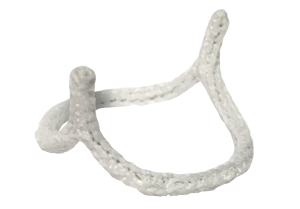 Austin, TX – August 15, 2017 – BioStable Science & Engineering, Inc. announced today it has received FDA market clearance for the HAART 200 Aortic Annuloplasty Device, the first and only annuloplasty device designed specifically for bicuspid aortic valve repair. With FDA clearance of both the HAART 300 and HAART 200 Aortic Annuloplasty Devices, BioStable is now able to offer U.S. surgeons a comprehensive portfolio of aortic valve repair solutions that addresses all forms of aortic valve insufficiency. A Bicuspid aortic valve (BAV) is a congenital malformation where the aortic valve forms with only two functional valve leaflets instead of the normal three. BAV is the most common congenital heart defect, affecting up to 2% of the population, and carries significant risk of cardiovascular complications. Patients with BAV have significantly higher risk of developing aneurysms or dissections of the aorta and approximately 53% of patients will require aortic valve replacement within 25 years of being diagnosed. Most BAV patients undergo aortic valve replacement between 40 and 60 years of age, subjecting them to increased risk of reoperation or complications associated with valve replacement technologies. Aortic valve repair is an emerging surgical alternative for patients with bicuspid aortic valve insufficiency that may offer improved patient outcomes compared to valve replacement. The HAART 200 Aortic Annuloplasty Device is designed to facilitate valve repair in patients with aortic valve insufficiency due to BAV. The device is designed to reduce annular diameter based upon leaflet size, to conform the annulus to a circular, symmetric shape for improved valve function, and to stabilize the annular geometry long-term. Michelena HI1, Khanna AD, Mahoney D, et al. Incidence of aortic complications in patients with bicuspid aortic valves. JAMA. 2011 Sep 14;306(10):1104-12. Vallabhajosyula P, Szeto WY, Habertheuer A. et al. Bicuspid aortic insufficiency with aortic root aneurysm: root reimplantation versus Bentall root replacement. Ann Thoracic Surg 2016;102:1221-8.